While I’m waiting for Opera in Linux to improve further (its already pretty great! ), I’ve decided to make a couple of adjustments to make the browser feel a little more integrated. The only change to the skin (thus far) is the tab bar background which now allows for a smoother appearance between the tab bar and window title. Previous skin versions are now available on page 3. Get the Speed Dial backgrounds on Page 2! I’ve moved them to page 2 since the main interest of this post is the on the skins. Isn’t the pink colour a little lady-like? Thanks! I’ve actually fix that and a few other problems that I’ll be releasing shortly. Updated skin and new Speed Dial backgrounds. Nice work. Can you make the same adjustments for Radiance skin? I prefer the lighter version of default theme. Sure. I probably won’t keep it up as much as the ambiance skin, but I’ll put one together for you shortly. I’ve been working on this, but something is wrong with either Opera or my script and it’s not accepting the modifications that I’ve made properly. I can’t figure it out yet, but I’ll post it as soon as I figure out what is going wrong. If by not accepting chages you mean that instead of skin color Opera draws just gray then I’ve expirienced it myself too. That is exactly what it is doing. 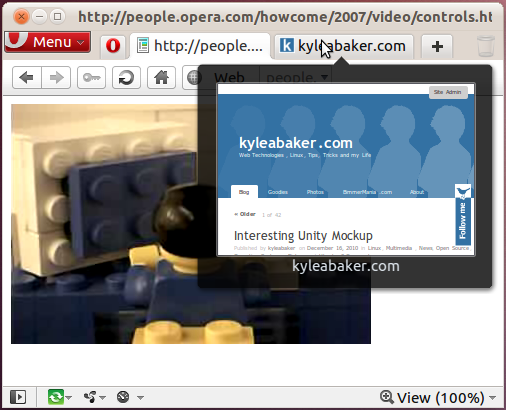 I’ll look into it further in the morning, but for now I’m stuck..
How to remove titlebar in opera 10.54 on ubuntu 10.04 ? It can be done with Compiz. From CompizConfig Settings Manager (might have to install it first) goto Window Decoration and where it says Decoration Windows add the text “(!title=Firefox) & (!title=Opera)” (or just the Opera part if you don’t want it to do firefox too). New Radiance skin is now available for Opera 10.60+ by request from MeanEYE (it may also work with 10.5x, but I’ve not tested yet). I also released an update to the Ambiance skin! To use the default Speed Dial images for these, make sure to clear the image path you currently have entered in the Speed Dial config dialog and click OK. Please do not copy the default skin, but rather make a new skin and only include the changed elements. Make this new skin fall back to the standard skin. That would make the skin 50k instead of 750k and would be the proper way to make them. Hey, nice work, since the improvemens in your skin are on a very different area then mmy Opera Ubuntu 10.04 Skin, i would like to ask you, if you allow me to use the matching backgrounds and the progress/load-bar for my skin. I was wondering, do you keep some sort of change log for those skins. Or perhaps post a version/change date on page itself. Am keeping an eye on this page but remembering exact filename can be troublesome after longer periods of time and I have to view file name before downloading in order to see if it was changed. Thanks allot for this nice skin. It made my day! I’ve updated the skins so changes to the 10.60 final skin are now included. They are very minimal, but you can install the new skins (linked above) if you want to get the tweaks. I’ll be posting these skins on My.Opera in the official skins repository very soon so keep an eye out! thanks !! very nice ! Hi! I love these skins to death (especially Radience)! I only have one “small” problem: I tried to use them on Windows 7, too, and they work fine, except the minimize-restore-close buttons keep disappearing when the menu bar is hidden. Hovering the mouse above them makes them appear but when I minimize Opera then restore it they’re gone again. Aside from this problem, the skins work perfectly. Could you please do something about this? Hey, thanks for the feedback. I’ll look into this and see if I can figure out why they are disappearing. I just wanted to say that i love your skin. This is the absolutely best skin for Opera on Ubuntu. At first I was a little skeptical when I had to download the script thing but I downloaded it only because I trust you. I just wanted to know if there is any way to look at the source of your script thing. In the latest version I was a little worried when I saw the screenshot of the new redesigned buttons but I love them. Keep up the great work, making my Opera look beautiful on my favorite OS. It’s great that somebody made a proper desktop integration theme for Opera; the one thing about those “unified window border and menubar” GTK themes is that they look terrible with a tabs-on-top browser with no menubar. Thankfully, your theme fixes that. However, I’ve noticed a regression in the latest version: The toolbar background matches the skin color properly, but the tabs are gray. It’s barely noticeable, but present. It’s there in your screenshot, too, so it’s not just my theme. Thanks. I’m working up an update at the moment to include some fixes released today with Opera 10.61 RC1. I’ve been trying to work the colors to integrate as much as possible and recently tweaked the tabs a bit. I’ve just updated the Maverick skins with plenty of newly tweaked icons and fixed the refresh icon. Enjoy! 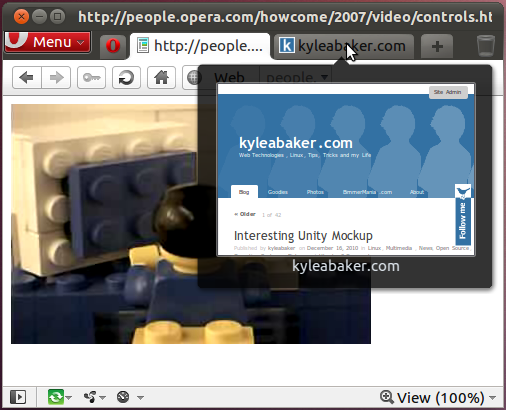 Pingback: Ubuntu 10.10 Opera 10.70 skins – Opera has never felt this native! Hopefully its better. If not, let me know! Updated the all skins for Opera 10.60+ so they are all compatible with Opera 11.00. There are detailing updates for the Ubuntu 10.10 skins. Changes include tabs and toolbars. Known issues at this time are only for the Ubuntu 10.10 Ambiance skin: Text is the Main Bar, Status Bar and hidden top Personal/Bookmarks Bar is difficult to read when its positioned at the top. Text in the Main Bar is also difficult to read when positioned on the left or right for the same reason. The Radiance skin is looking nice. The In the Ambiance skin, you seem to be following my advice word-to-word, which is dangerous since I’m not a graphic designer as well. :). The dark background tabs do look nicer but the tabs have lost their beveled look. That is the only other way that I know of to work them in over that title bar background without them looking too much out of place. Hi, great skin, Im just having an issue with the buttons. From the photo, it looks like the buttons are in a monochromatic color scheme that complements the system theme. However, my installation seems to be using a colored scheme with orange for the Back/Forward/Home, blue for Refresh, and green for New Tab. Any ideas? I have no problem locating the old icons and replacing them in the skin folder if that would work, but I thought there might be a solution Im overlooking. Thanks a bunch, keep up the good work. Check to make sure that you’ve not specified a “color scheme” the in Appearance options. If so set it to “None”. Ah, nevermind, I see that you’re talking about the button icons. This was intentional to match the style of the same buttons found elsewhere in the OS theme. If you replace the icons, simply change to a different skin and back to apply the changes. Updates to all Opera 10.60+ skins. This fixes the issues with the latest Opera 11 snapshot! Updated skins to fix some issues with Tab Stacking. Also, by popular request, all skins now use the mono-colored address bar buttons rather than the nautilus style icons. Still having problems reading tab text. 🙁 After a few hours I found that the glassy effect isn’t working out that well for me. I just posted here to say… I love you. Updated the Maverick skins to fix a few skin changes that were made to the official skin since my last update. Actually I also just posted an update for the Lucid skins as well. How did you change Opera’s user agent to recognize Ubuntu? Would be great if Opera could use Notify OSD. Is there a way to use them? Maybe with an extension? It would be nice if you did an extension or something in order to use Ubuntu notification sistem, because the themes are wonderful and with Notify OSD the integration between Opera and Ubuntu would be perfect. Opera extensions are not capable just yet of adding these types of features, but maybe in the future they will extend this ability. I’ve also wanted this feature for a while now! skin for ubuntu 11.04 ? Pingback: Ambiance skin για τον opera browser! Dios les bendiga en grande. Next Next post: func20000 – how far does your UA get?